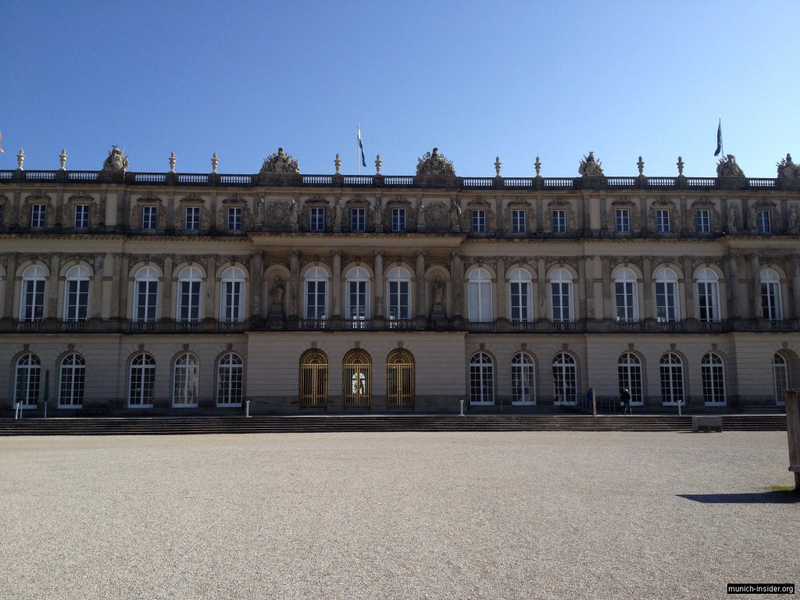 Not far from Munich, you can find the Bavarian Versailles, or rather its likeness. This is no exaggeration. King Ludwig II of Bavaria bought a big island on Lake Chiemsee, where he tried to build a replica of the Château de Versailles. We decided to look at this creation of the “fairytale king”, and at the same time to spend some time on the beautiful lake. 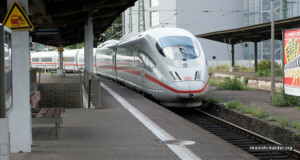 We left Munich around 9 am on the A8 autobahn in the direction of Salzburg. It was Tuesday, the highway was busy, but we did not encounter any traffic jams. Less than an hour later we arrived in the town of Prien, the starting point for the cruises on the lake. 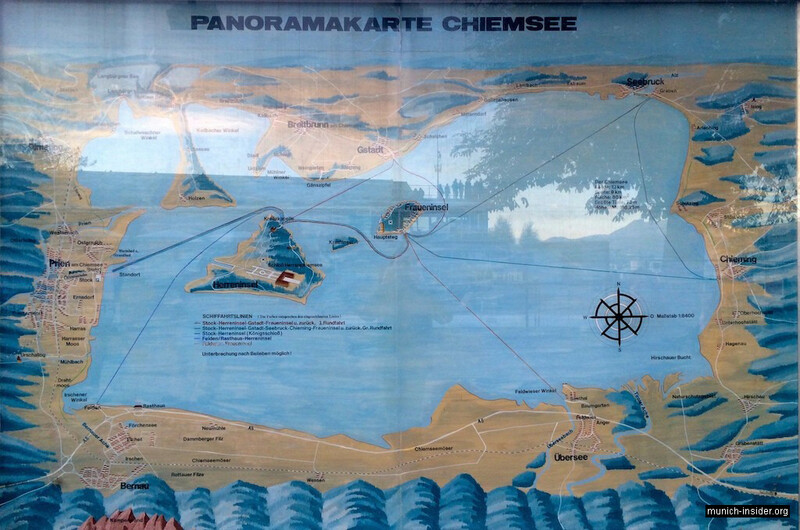 We bought a cruise with stops at the two famous islands, Herrenchiemsee and Frauenchiemsee; the literal translations of these names are Men’s Chiemsee and Women’s Chiemsee. We paid €8.50/person just for the boat. They sail every hour, so we did not have to wait long. 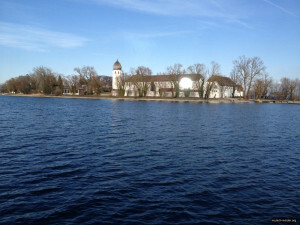 It was about 10 minutes sailing to the first stop, “men’s island” Herrenchiemsee. 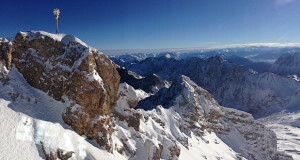 A beautiful view of the Alps opened behind the southern shore of the lake; the mountains were still snow-capped. At first we did not notice anything remarkable on the island itself; the palace could not be seen from the shore. We bought a guided tour (€8/person) right on the pier and walked to the palace for about fifteen minutes. 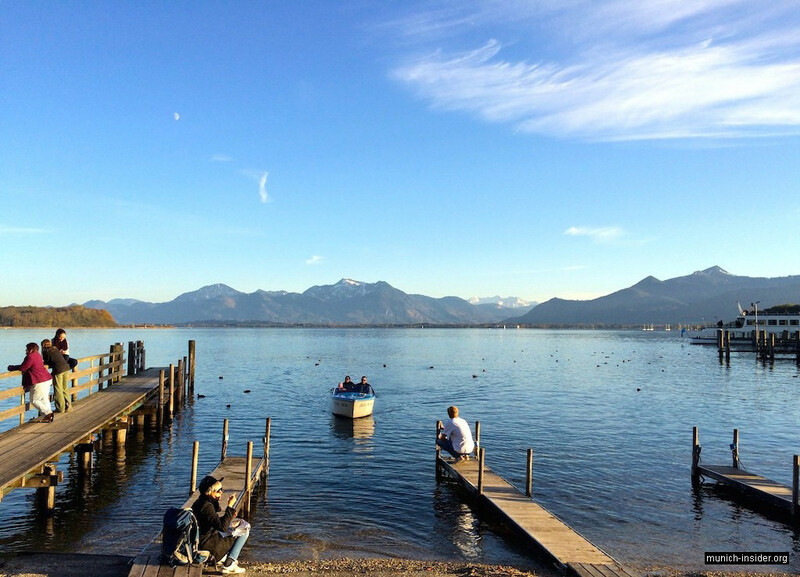 In the summer one can ride a horse carriage (for additional price), but it was April when we visited Chiemsee. The palace and especially the park in front of it indeed resemble Versailles, though, I would say, a more modest version of it. 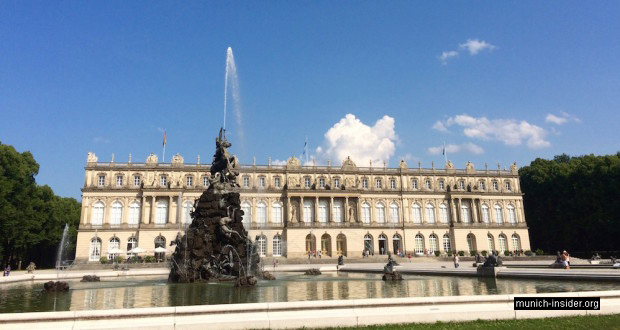 However, the Herrenchiemsee Palace has an advantage because of the high mountains in the background. There are straight alleys to the lake in the park. BTW the tour can be taken in different languages, so request the language you want when buying the tickets. The interior of the palace would not lose to Versailles in opulence. We noticed that all the portraits depicted the same man in different clothes. Well, it was certainly French King Louis XIV, whom Ludwig II of Bavaria adored. We were struck by the beauty of chandeliers and famous Meissen porcelain vases, as well as by the magnificent fireplaces. Unlike Versailles, even a swimming pool was built here. In short, there was everything for a luxurious life. 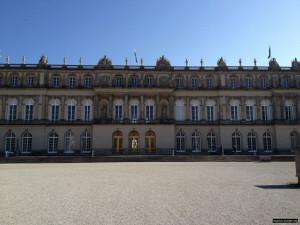 Surprisingly, King Ludwig himself lived here a total of 8 days only. Actually, the palace was disused for many years, though now it serves as a major tourist attraction. Anyway, we have to thank this unfortunate king for creating it. By the way, the visitors are not allowed to take pictures or use cell phones in the palace. 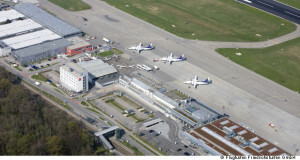 Security is similar to airports; moreover, one employee was following us all the time making sure that nobody breaks the rules. We strolled through the palace halls for about an hour, and then went down to the museum shop. Here one can buy lots of porcelain things: tableware, clocks, figurines and so on. Of course, they are not real Meissen and are made by local craftsmen, but still everything is of very high quality. They are not cheap either, the prices vary from tens to hundreds of euros, but tourists buy quite a lot anyway. We could not resist the temptation and also bought a few items. There is a small cafe on the first floor of the palace, but we decided to have a more substantial meal in the restaurant we had noticed earlier at the pier. 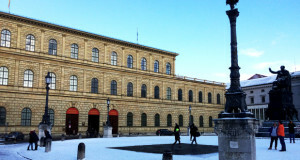 We also visited the museum of Ludwig II located in the palace and learned more about his short but eventful life. Furniture, personal belongings and photographs of the king are exhibited in the museum. He was a passionate man, indeed a dreamer; he had money, but little real power. It was the second half of the 19th century and Bismarck was actually the strong man in Germany. 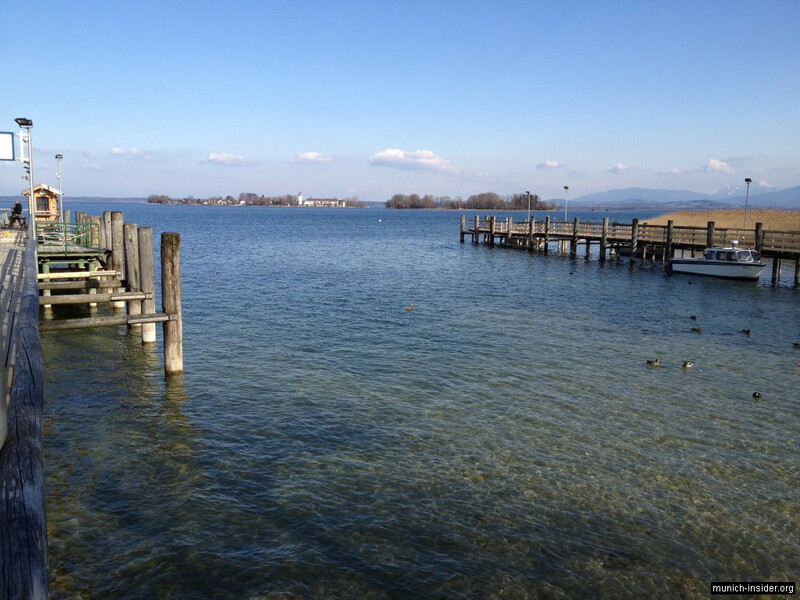 In 1886, Ludwig drowned in Lake Starnberg near Munich at the age of 40. There were rumours that it was not an accident, and he was a hindrance to someone in power. But that’s another story. 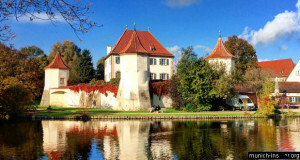 We headed back to the pier and on the way visited an old palace built 100 years before Ludwig. This palace did not impress us. 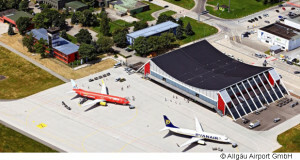 The exhibits included the history of the German Constitution and a couple dozen landscape paintings of Lake Chiemsee. The Kaiser room and the garden were closed. So, after about 10 minutes we went to the cozy restaurant in the courtyard. 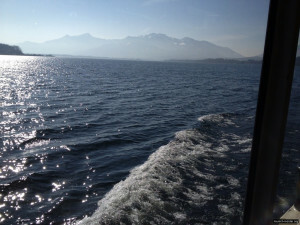 We sat outside with a beautiful view on the lake and the Alps. Good food and beer in a fabulous environment – what else could one desire for a retreat on a day off. However, we had to interrupt this idyll after half an hour – our boat was docking to the pier. 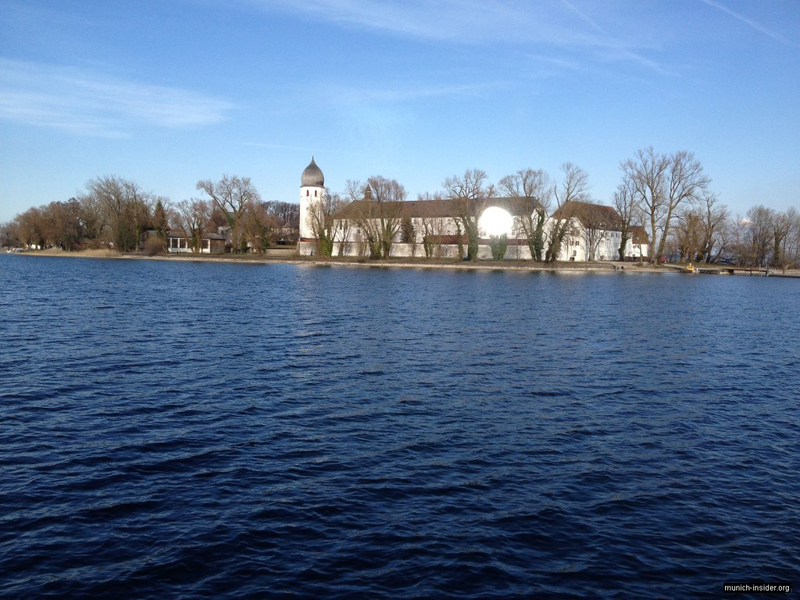 The next stop in our program was the Frauenchiemsee (women’s) island. 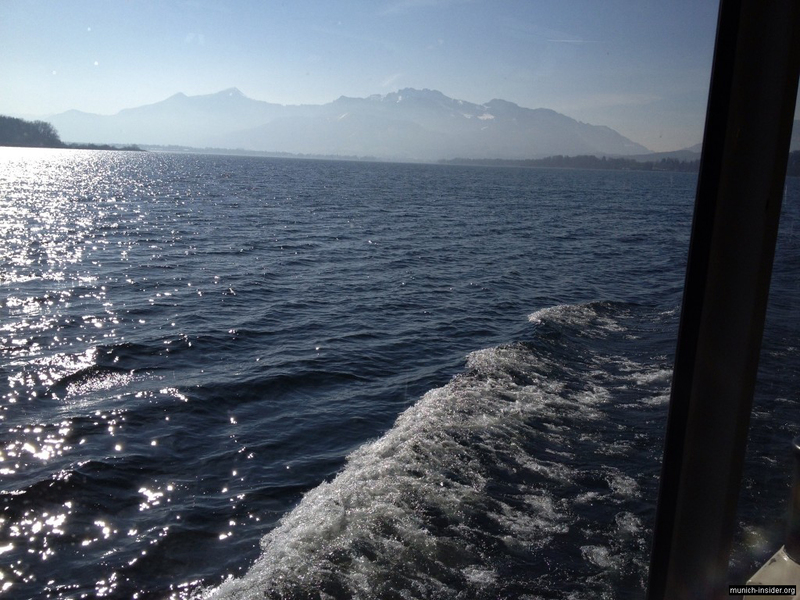 It is another ten minutes sailing from Herrenchiemsee. This island is much smaller than Herrenchiemsee. The first thing we saw was a pretty little church near the pier. The main attraction on the island is a female monastery which was founded in the 8th century. Some people live on the island and their houses are very picturesque. Locals and tourists were drinking beer in a beer garden on the lake shore. There are sandy beaches on the island, which would have probably been very tempting in the summer. We just relaxed a bit in this nice setting, but it was not much to do on the island in this time of the year. Half an hour later we left this paradise and headed back home.